Alright, so I wanted to wait until I had more themes done, but I'm lazy and I'll only be working on them a little bit. Plus other people seem to want to contribute their emoji edits, so it's not just me adding these. Each board theme has two changes, although any that I did not make myself will not have both. The first is the default emojis. These are what you see. They change depending on what your theme is. If you want the emoji you use to be seen the same no matter what theme someone is using, you'll have to use one of these. Not every emoji is accounted for, and as of right now there is no way to access every emoji this way, but in the future it might be expanded upon. 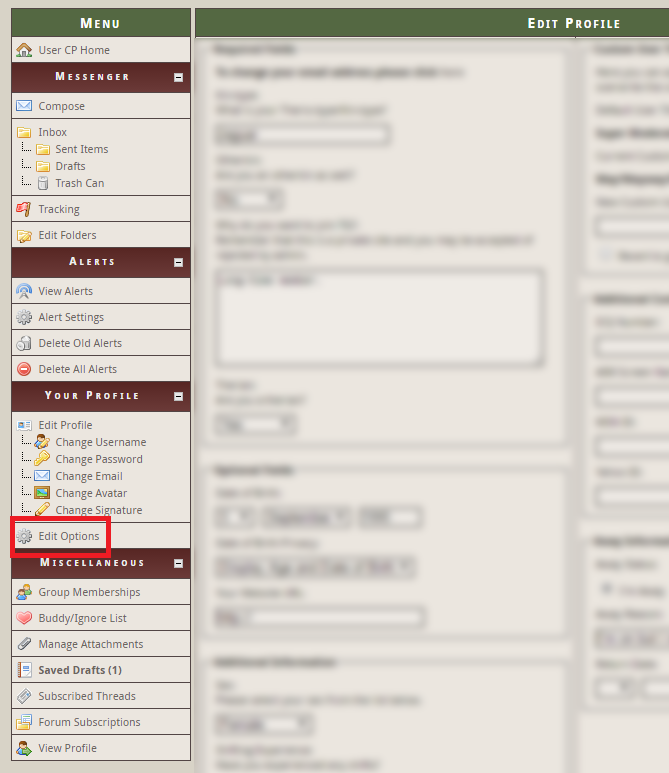 The second change, the one you won't see for some of the themes, is the change to the icon beside the boards. 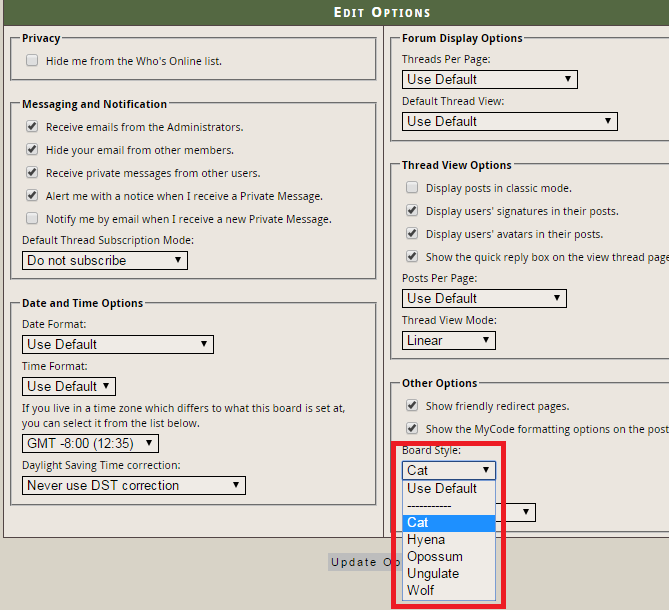 To change your board theme, follow these steps. 1. Go to your edit profile screen. 2. Go to Edit Options. 3. Changing your board theme is in the bottom right. 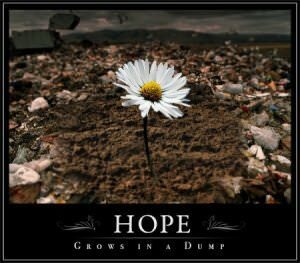 And that's it! We'll try to keep you updated when additional themes are added, but feel free to pick one you like most. 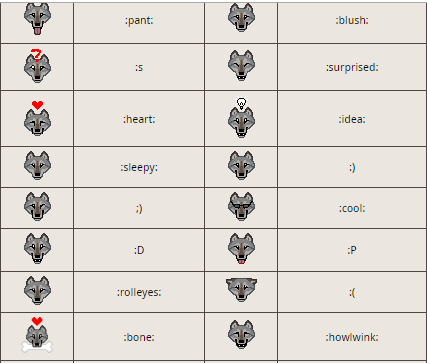 It's been on my mind to also add the "human" theme with the default yellow smileys, since one member once said he had trouble understanding the wolf emojis. But that was just one person saying it once and I think he pretty much just came here to tell me that and then left, so not a big priority. It can be back burner priority. I'm in no position to give much input, but I was thinking "cat" and "wolf" could be called feline and canine instead? 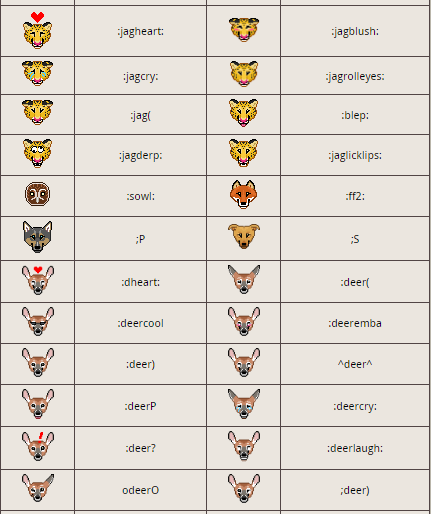 I know the emojis are mainly wolves and cats but for people who are, for example a dog or a dhole, cheetah and cougars, they could feel more "included" if the themes were called "canine" or "feline" instead? I don't know I guess it's just a minor silly detail. TBH we'll probably rename them, but not like you think. I had plans to make a tiger version and a house cat version, as well as a fox version and a dog version. Basically, the reason I'm avoiding having them named more generically is because of my plans to make other more specific versions. Eventually I'd like ungulate to be renamed deer and cat to be renamed jaguar. But all in due time when/if I make them. As for requests, seeing as I'm utterly back logged and need to work on the ones I planned first, I'll try to remember to add them to the list. In the mean time, I tend to do proof of concept emojis, aka I make a standard for a species to see how feasible it is to make. 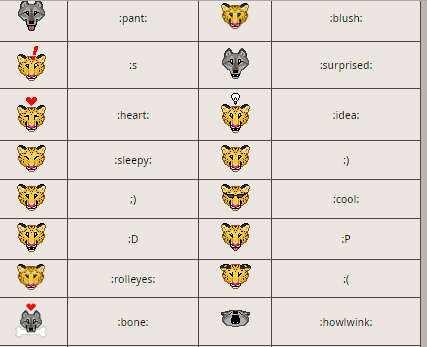 Human emojis don't seem very fitting on a board full of animal people. haha Also they're sort of an eyesore, but I also just hate yellow. (2017-01-18 10:54)Neon Rosettes Wrote: TBH we'll probably rename them, but not like you think. As petty as it sounds, I agree with Wereren. But I also hate yellow...so that's too biased no-thankyou's. (2017-01-19 3:37)Ishvala Wrote: As petty as it sounds, I agree with Wereren. But I also hate yellow...so that's too biased no-thankyou's. This is awesome. I'm glad it happened.